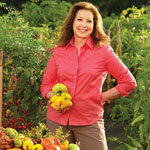 To say that Amy Goldman has made heir­loom fruits and veg­eta­bles her life’s work would be an under­state­ment. By pro­fes­sion she is a clin­i­cal psychologist—but she left that career behind years ago to plant and grow these unique vari­etals, and to advo­cate, write about and pro­mote the agri­cul­tural her­itage and diver­sity of heir­looms. She is the author of three award-winning books on the sub­ject, and has writ­ten for Martha Stewart Living, Fine Gardening, Organic Gardening and Garden Design. Along with tele­vi­sion appear­ances, she has also been pro­filed by the New York Times and Washington Post, among others. Amy is inti­mately involved with Seed Savers Exchange, the renowned non­profit orga­ni­za­tion ded­i­cated to sav­ing and shar­ing heir­loom seeds. She recently retired as chair­man of the board, but retains the post of spe­cial advi­sor to the board. 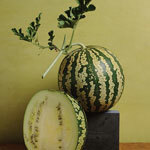 Amy tells the story of this melon in her book Melons for the Passionate Grower. “Originally intro­duced as Sun, Moon and Stars by Peter Henderson and Company in 1926, it was still alive and well a decade later, accord­ing to the J. D. Robinson Seed Company, which described the fruit as novel but not with­out merit. Later it was dropped from com­mer­cial pro­duc­tion and vanished. “Kent Whealy, the cofounder of Seed Savers Exchange, didn’t for­get the melon. After years of search­ing, he found what he was look­ing for not far from home, near Macon, Missouri, where the water­mel­ons grow. In the spring of 1981, Merle Van Doren saw Kent give an inter­view on local tele­vi­sion. Merle wrote that he was keep­ing the melon and would have seed at har­vest time.” Whealy ended up obtain­ing the seeds. “It was then rein­tro­duced and is now beloved,” said Amy. Another heir­loom draws one in, just because of its name. “Radiator Charlie’s Mortgage Lifter Tomato,” Amy laughed. “What is that name all about? Well, for starters, it’s one of the biggest toma­toes that I’ve ever grown. To para­phrase from my book The Heirloom Tomato, eat­ing a thick juicy slab of Mortgage Lifter, mar­bled with white, is like hav­ing a last steak sup­per before you die and go to tomato heaven. “This big beef­steak tomato was bred by M. C. Byles in West Virginia in the 1930s by cross­ing four heir­loom beef­steak types. His nick­name was ‘Radiator Charlie’ because he was a radi­a­tor repair­man. His shop was located at the bot­tom of a steep incline in Logan, West Virginia, and the story goes that he would just wait there for trucks with busted radi­a­tors to roll back into his shop. In another tomato story, Amy man­aged to unearth new infor­ma­tion about a famous vari­ety. 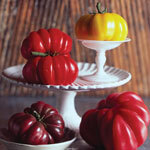 “There’s a lot of mis­in­for­ma­tion about the orig­i­nal Brandywine tomato,” she said. “Sudduth’s Brandywine, also known as Brandywine, is a deli­cious pink beef­steak type, and it grows on a plant that has potato leaves. Most peo­ple believe it to be the orig­i­nal Brandywine. I went back to the seed cat­a­logues to learn more. The orig­i­nal Brandywine—today known as the Red Brandywine—is red-fruited and grows on plants with reg­u­lar leaves. It was intro­duced by Johnson and Stokes in 1889. As afi­ciona­dos have dis­cov­ered, many heir­loom vari­eties have fla­vor far supe­rior to indus­tri­ally grown pro­duce. There is good rea­son for this. “Generations of farm­ers and gar­den­ers have selected their best and most fla­vor­ful vari­eties and passed the seed down to the next gen­er­a­tion,” Amy explained. “Heirlooms are designed to be home­grown and used in cookery—not bred for trans­port or mechan­i­cal har­vest­ing. Most heir­looms grow on tall inde­ter­mi­nate plants and pro­duce a har­vest over an extended period; the indus­trial tomato grows on a short plant and is har­vested green all at once. There’s a cor­re­la­tion between big plants and big fla­vor: the more foliage, the more pho­to­syn­the­sis, and hence toma­toes with more fla­vor and sugar. Amy pointed out that there are many rea­sons for some­one to start grow­ing heir­looms. “They’re beau­ti­ful, they’re deli­cious, and they’re easy to grow,” she said. “By grow­ing heir­looms you are also pre­serv­ing the best of the past for the future. This notion is some­times called ‘eater-based con­ser­va­tion.’ By grow­ing and sav­ing heir­loom seeds, you’re help­ing keep these vari­eties alive. 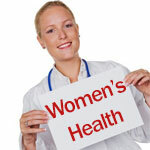 Hence it’s good for you and it’s good for the planet.” Growing them is reward­ing and fun as well. “The good news is that it’s just as easy to grow heir­looms as it is to grow mod­ern hybrids,” Amy said. “The same basic kinds of advice hold true: plant a gar­den with fer­tile loamy soil or add soil amend­ments as needed; pro­vide enough space for things to grow; and be vig­i­lant. For the novice gar­dener, there are some choice how-to books on heir­loom gar­den­ing available. “Many def­i­n­i­tions of heir­loom exist out there, so let me share with you my def­i­n­i­tion,” Amy con­tin­ued. “An heir­loom is ‘a vari­ety of value that is open pol­li­nated and breeds true from seed.’ Thus seeds can be handed down to the next gen­er­a­tion. Open pol­li­nated refers to a stan­dard vari­ety that breeds true from seed—saved seed pro­duces off­spring like the par­ent (unlike F1 hybrids*). As Amy has pointed out, some­one get­ting involved with heir­looms is doing a lot more than just cre­at­ing inter­est­ing and fla­vor­ful pro­duce. She her­self observed this early on and got heav­ily involved with the Seed Savers Exchange. It is an orga­ni­za­tion that, since its found­ing, has done a tremen­dous amount of good in for­ward­ing and pre­serv­ing this vital nat­ural heritage. Seed Savers Exchange has its own vault in which seeds from the rarest vari­eties are pre­served for pos­ter­ity. “Seed Savers Exchange is also a reg­u­lar depos­i­tor of seeds to the Svalbard Global Seed Vault in Norway,” Amy added. “We sleep eas­ier know­ing that if dis­as­ter strikes us—for instance, if a tor­nado does dam­age in Iowa, where Seed Savers’ vault is located—we have some safety dupli­ca­tion. We’re deeply grate­ful to the gov­ern­ment of Norway for giv­ing us this free insur­ance policy.” Amy recently mar­ried Cary Fowler, who headed the inter­na­tional com­mit­tee that pro­posed the estab­lish­ment of the Seed Vault; he cur­rently serves as chair of its International Advisory Council. For more infor­ma­tion on the Seed Savers Exchange, please visit www.seedsavers.org. Further infor­ma­tion on Amy Goldman and her work can be found at www.rareforms.com. Amy Goldman’s books Melons for the Passionate Grower, The Heirloom Tomato, and The Compleat Squash are avail­able from the Organic Connections bookstore. *F1 hybrid: A term used in genet­ics and selec­tive breed­ing. F1 stands for Filial 1, and indi­cates the first gen­er­a­tion of plants or seeds result­ing from the cross­breed­ing of dif­fer­ent parental types.